Green sapphire engagement ring. Peacock green sapphire 3ct oval halo diamond ring 14k Rose gold. Engagenet rings Eidelprecious. Green sapphire Rose gold engagement ring. Engagement ring by Eidelprecious. This ring features a 3 oval sapphire. The color is gorgeous very deep peacock green. The sapphire is very beautiful and clean. Absolutely perfect! 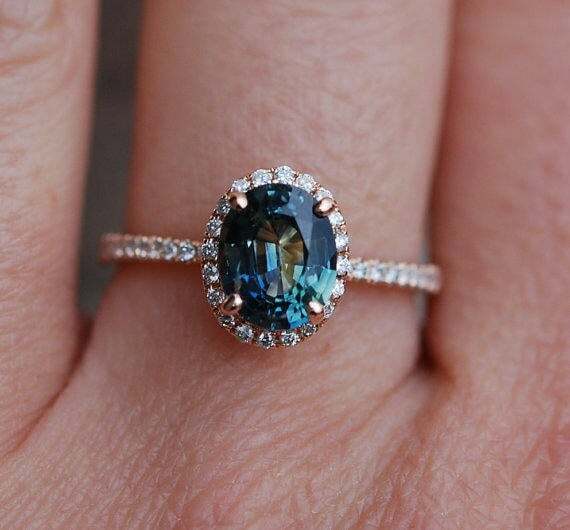 The sapphire is themost wonderful combination of blue and green and the band is wonderfully dainty! The ring is beautiful and arrived very quickly!